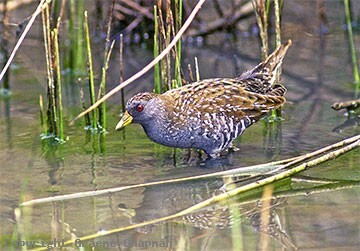 Spotted Crakes are probably the most common, and certainly the most frequently observed crakes in Australia. They like feeding in or around the edges of shallow water and suitable water levels are crucial to their presence - after heavy rain, water that is too deep greatly limits their ability to feed. Reed lined swamps with muddy margins are ideal. 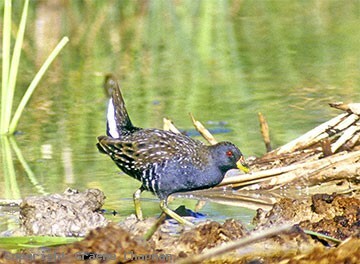 Unlike most of the other crakes that rarely stray far from the safety of the reed beds, Spotted Crakes do wander further out into the open, probably why you see them more often than the others. 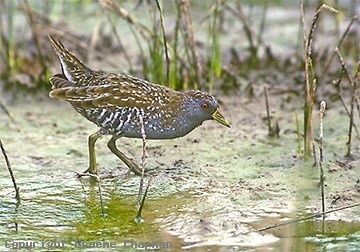 They are also a bit more vocal than other crakes and so easier to locate. 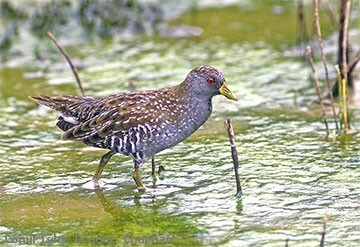 049201 ... Australian Spotted Crake.